The real world will meet fiction when the Smith Winter Mitchell Agency of "Mad Men" brainstorms ads for real-life products. 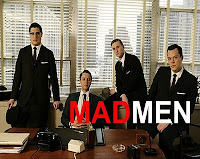 The Smith Winter Mitchell Agency vignettes will be airing during “Mad Men” every Sunday night on AMC at 10pm est. These vignettes showcase how a fictional 1960s ad agency, SmithWinterMitchell, develops campaigns for the six iconic Unilever brands (Dove, Breyers, Hellmann's, Klondike, Suave Hair, and Vaseline), combining witty historic parody with modern ad footage. They also showcase these iconic brands and celebrate their heritage on a hit show that is culturally and contextually relevant. To view them all, visit the SmithWinterMitchell channel on YouTube. Pink Lemonade received some of these unilever products in exchange for this post.